Launch X431 Diagun IV is an slim evolutionary vehicle diagnostic tool. 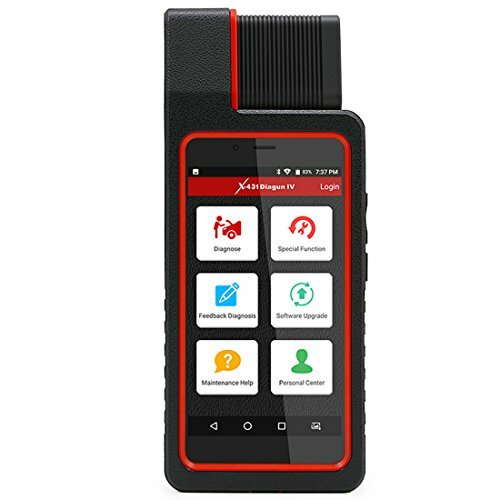 In addition, X-431 Diagun IV supports Wi-Fi connection, one-click update, diagnostic feedback and all kinds of service functions (including oil lamp reset etc). Diagnose Configures: X-431 Diagun IV to operate as a diagnostic tool. Special Function: To perform some maintenance items, including electronic throttle position reset, ABS bleeding, oil lamp reset etc. Feedback Diagnosis : This option allows you to feed back the diagnostic reports/software bugs to us for troubleshooting and analysis. Software Upgrade: To update vehicle diagnostic software. If you keep signed in, a pop-up message will appear on the screen once a newer version is detected. Maintenance Help: To browse the FAQ, Quick Start Guide, User Manual and How-To videos. Personal Center: To manage, activate your VCI connector, diagnostic report or personal information etc. 2.MAIN FUNCTION: Read DTCs, Clear DTCs ,Read data stream, built-in Wi-Fi module makes surfing on the internet freely., allows you to send and receive emails. If you have any questions about this product by Launch, contact us by completing and submitting the form below. If you are looking for a specif part number, please include it with your message.